“Michelle LaVaughn Robinson Obama” by Amy Sherald, oil on linen, 2018. Courtesy National Portrait Gallery, Smithsonian Institution. 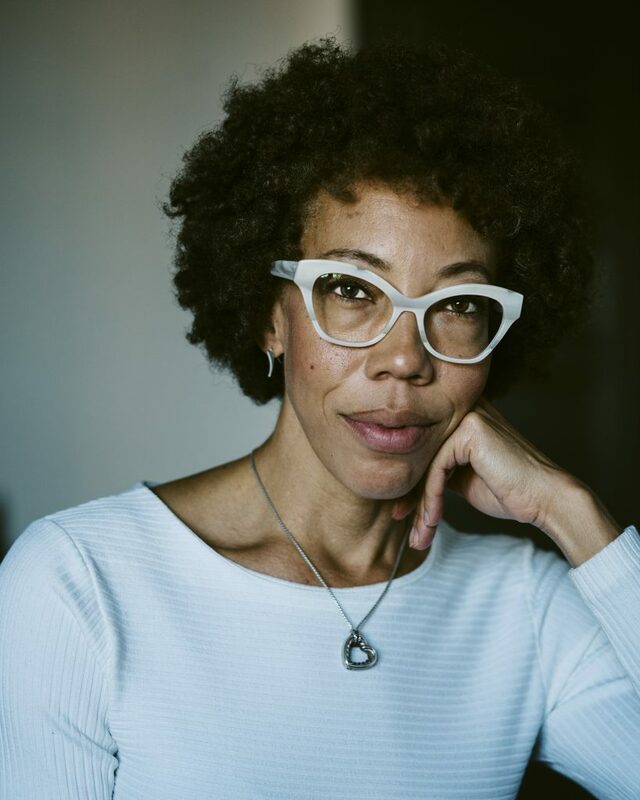 Baltimore-based artist Amy Sherald—long-known here and now internationally for her grayscale African-American figures dressed in bright clothing and set against flat planes of buzzing color—unveiled her portrait of former First Lady Michelle Obama Monday morning alongside Kehinde Wiley’s portrait of former President Barack Obama at the National Portrait Gallery, which commissioned the paintings. Sherald is the first-prize winner of the Portrait Gallery’s 2016 Outwin Boochever Portrait competition. Selected by the Obamas, Sherald and Wiley are the first black artists commissioned to paint a presidential couple. Sherald’s portrait depicts the former first lady seated and dressed in a flowing white dress with geometric accents, forming a kind of pyramid against a field of sky blue. This portrait is more reserved in the intensity of its hues than other Sherald paintings (check out the vivid, almost psychedelic ‘Grand Dame Queenie’ in the National Museum of African American History and Culture), bringing more attention to Obama’s pensive gaze—she almost looks like she’s about to offer a challenge. 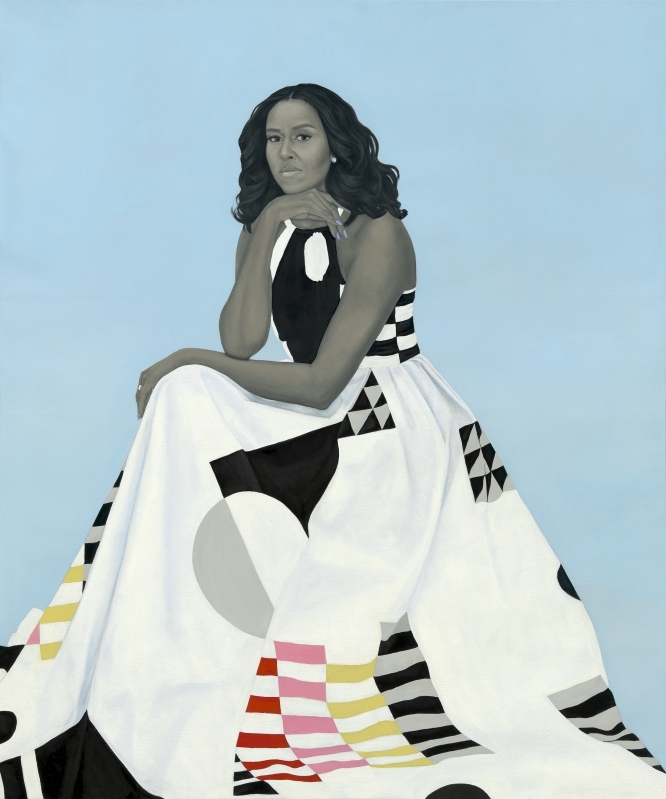 As she often does with her subjects, Sherald painted Obama’s skin and hair in gray tones, in effect challenging the centralization of race upon skin color. “Within the first few sentences of our conversation I knew she was the one for me,” the former first lady said at the unveiling ceremony of her meeting with Sherald, noting that upon meeting the presidential couple, both of whom the artist was being considered to paint, Sherald seemed particularly intent on painting Michelle. Amy Sherald. Courtesy National Portrait Gallery, Smithsonian Institution. Kehinde Wiley’s portrait of Michelle Obama’s husband also shows the former president seated, but in full color with a lush and ornate environment (specifically, a wall of green leaves and small bursts of flowers) typical of Wiley’s portraits. Like their subjects, both paintings defy the rules that historically determined what they could be. Both paintings were unveiled in front of an invitation-only audience, which included Baltimore Museum of Art Director Christopher Bedford, as well as celebrities like Tom Hanks, star of Carly Rae Jepsen’s ‘I Really Like You’ music video. This career milestone comes right after Sherald snagged another big honor, the $25,000 David C. Driskell Prize, which recognizes contributions to African-American art; and not long after Sherald was named a new board trustee at the Baltimore Museum of Art. Next up: Sherald’s first solo museum show at the Contemporary Art Museum St. Louis, opening in May.